The Mini Pie Revolution Headquarters: The Mini Pie Revolution Round-Up! The Mini Pie Revolution Round-Up! What a great way to start the New Year! When we decided to host our very first blog event, we were nervous. You know how it is... what if we throw a party and nobody comes?! But you did come to our party, and you brought fabulous, adorable, creative, and scrumptious mini pies with you! Viva la revolution! Entries were added to this round-up as they arrived (via email or as we found them via technorati), so please don't read anything into your place on the list. 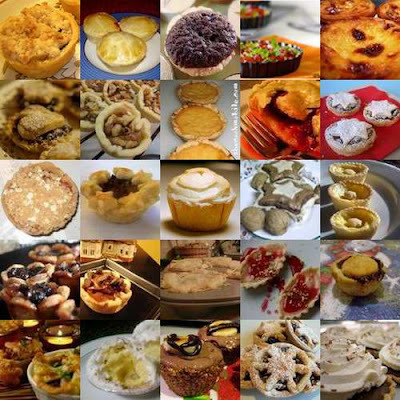 Check out the entries, then learn which mini pie won the judges' hearts, minds, and stomachs. Our first entry comes from Sara at Cupcake Muffin, who combined two classic flavor-parings and whipped up these adorable little Apple-Pear-Rum Raisin Mini Pies with Crumb Topping. Fabulous! CakeLaw from Laws of the Kitchen made these luscious little fruit-packed Blackberry-Apple Pies. Don't you just know they're going to explode with blackberry flavor at first bite? Redacted Recipes is not eligible for a prize, of course, but Ann offered up these tiny Christmas Mince Pies in the name of The Revolution. Gretchen from Canela and Comino ruminates on the sneaky seductiveness of the tiny pie and offers up a delectable batch of Peanut Butter Fudge Cups. How seductive can you get?! Suganya over at Tasty Palettes went for a savory pie with a healthy low-fat crust and created these beautiful Cornmeal Crusted Tomato Tarts. While not exactly single-bite-sized, these lovely four-inch tarts can be held in the hand. Glorious Food and Wine put together these lovely little Mini Mince Pies, using star-shaped cookie cutters to shape the crusts. Adorable, no? Carla from But did they eat it? created super-healthy Mini Chocolate Pies, featuring avocado and tofu. And in answer to her own question, (did they eat it?) she reports that yes, they did! Adele of Tales of The Basil Queen took time out from studying law to create a savory new recipe with these wonderful Chicken, Fig and Mushroom Pies. They look like just the thing for dinner! Katy of Sugarlaws dreamed up these fabulous-looking Peppermint Tarts with Pomegranate Glaze, using crushed candy canes dissolved in yogurt. She brilliantly added a sprinkling of crushed salted pistachios over the pies' tops. Mince Pies are popular this time of year and we received another splendid batch from Joy, at Almanzo's Belly. 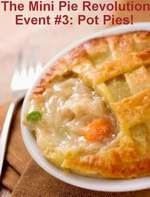 Joy took the time to make her own filling and provides the recipe and some step-by-step instructions with photos. Cara of Cara's Cravings made these yummy little Sweet Potato Mini Pies, topped with a walnut streusel, which she took to an office potluck. Lucky coworkers! The CookMobile sent in these lovely Mini Egg Pies along with an innovative tip for using a tortilla-maker to flatten the dough (avoiding over-manipulating it into a too-tough crust). Clever! Sarah, of Sweets by Sarah, finds that mini pies solve the dilemma of really wanting a single piece of pie without having to deal the left-overs. You make mini pies, eat one, and share the rest with friends! Her Triple Berry Mini Pies look like summer. It's nice to know that warm weather exists somewhere! Fragole & Cioccolato contributed to la rivoluzione in two languages with these Mince Pies All’Arancia (Orange Mince Pies). Adding orange zest and juice to the pastry, and marmalade and Grand Marnier to the mince filling, gives these pretty pies distinction. Sarah from What Smells So Good? submits "Mincemeat Tarts with Flair", a new-age twist on an old English "favourite"! Ben of Heights Eats offers up Mini Mud Pies with Bruleed Bananas with Cocoa-Almond Granola crusts. How much more tempting can you get? Vegan cupcakes take over the world? Not this month! Dayna of Seitan Said Dance baked beautiful Mini Cranberry Apple Crumb Pies. Danya claims these pies as her first original recipe. I say, expect great things from Dayna! Chris of Melle Cotte whipped up gorgeous Egg Nog Mini Cream Pies by layering a vanilla–eggnog pudding with whipped cream. Can we have rum or brandy on the side? Ladies, hold onto your Derby hats! Karyn of Hot Potato's not up for the prize, but she doesn't mind not making it to the winner's circle. Her rich chocolate-and-walnut Didn't-Make-it-to-The-Derby Mini Pies provide their own better-than-roses reward. At Baking History, Manuela made nutmeg-spiced Mini Custard Pies. I certainly think she "baked" history - these mini pies are sure to become a holiday tradition for many a blog-reading baker! Chef Patti Anastasia, of Anastasia's Table, made these delectable-looking Lemon Meringue Mini Pies. She used foil muffin cups as her pie forms, knowing that she could just cut the foil away if she had any trouble removing the pies later. Smart! Pie Architect agrees with us that "smaller is better" and redesigned her grandmother's Chocolate Pie in miniature, building up delicious-looking layers of flakey crust, chocolate and whipped cream. Yum. nicisme at cherrapeño posted a photo of these lovely-looking Mince Pies at the eleventh hour and promises us the recipe soon. Choosing a winner was NOT easy. We debated long and hard, and realized that it would have been a lot easier if we had narrowed the field to a theme (now we know!). As it was, there are so many appealing entries of so many types that we decided to go with a combination of subjective criteria and random selection. Our methodology? Each Revolutionary Leader picked three finalists based on: 1) Originality, 2) Good Looks, 3) How Badly The Judge Wanted to Eat It. Ben's Mini Mud Pies, Cara's Sweet Potato Pies, Manuela's Mini Custard Pies, Ronell's Turkey and Fois Gras Mini Pies, and Suganya's Cornmeal Crusted Tomato Tarts. Yes, you only see five pies on the list, because both Ann and Karyn selected Ben's Mini Mud Pies. We were going to toss the six finalists into a hat and pick one out randomly, but given that Ben was selected by both of us, we think he deserves the prize. So send us an email with your address, Ben, and we'll be sending you these lovely tartlette pans! Thanks everyone for joining the revolution and stay tuned for our Valentine's Day event Small Tarts Have Big Hearts! Congratulations to the winner and the moderators! Hoping to join the next one. Well done Ann and Karyn for organising this! I merely watched the revolution from the sidelines but looking at this delectable little lot I'd say the corrupt cupcake regime is doomed. It must have been tough picking a winner. There's at least half a dozen there I'd have had a tough time choosing from. Thanks for choosing my recipe! I hope some people try it. It takes a bit of time, but it's really not too difficult to make. I look forward to more mini pie recipes! Congratualtions Ann and Karyn for hosting such a successful event. The entries are all mouthwatering and I think I can make about two each month,which will take me a year and I can taste them all. 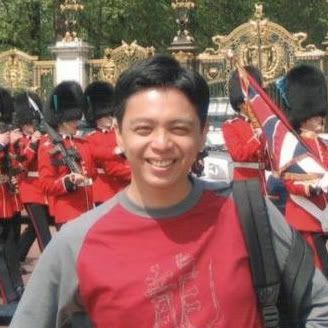 And congratulations to Ben too...now we are only waiting to see what he's going to show us in his prize? Thank you for this great event and for considering me among the finalists!! Every recipe in this collection is amazing; congratulations to Ben for his wonderful mini mud pies. It was fun to participate and I look forward to the next mini pie event for Valentine's Day. Delicious idea you have going on! Can't wait for next month's mini pie challenge! As a dessert lover,I'm a big supporter of mini-pies! Terrific round-up & I look forward to your next event! Fabulous all of you. I 'm not sure which to start with. Well done Ben! Oh, these are just precious! I love the idea of mini pies, and will be trying several of these delicious recipes. Thanks! Thanks for including me in the round-up, I've added the link on my blog. Wow, I am so honoured to be among the finalists. This event was so much fun. It pushed me to find healthy recipes. Thank you so much for being gracious including my entry.